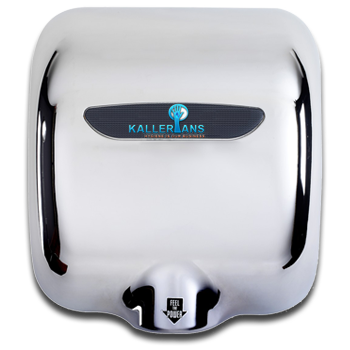 The new technological innovation from Kallerians for 3X faster hand drying performance. Integrates automatic sensor and electronics for 80% less energy cost when compared to conventional hand dryers. Next Generation Hand Dryer with advanced technology that delivers three-times-faster hand drying performance than the conventional hand dryers that take from 30 to 45 seconds to get a user’s hands totally dry. Our hand-drying system is designed to run on 15-amp service (making it great for older buildings). The combination of these two factors results in 80% less energy cost per use vs. conventional hand dryers. Built from Die-cast zinc alloy is a beautiful one-piece, heavy-duty, rib-reinforced, lightweight, unbreakable, rustproof casing with bright chrome plated finish. Handdryerindia.com is the leading supplier of hand dryers and automated bathroom products and accessories. Die-cast zinc alloy - bright chrome plated finish.